Illustration of mitochondria with an inset showing two types of membrane protein found in the inner membrane (pink) of a mitochondrion. Mitochondrial complex I (blue, centre), catalyses the first step of the electron transport chain. It oxidises NADH (blue, right) to NAD+, transferring electrons to ubiquinone (not seen). In the process it pumps four protons (H+, gold) across the membrane. This, and the action of other proton pumps in the membrane, creates a proton gradient that is used by ATP synthase (red). 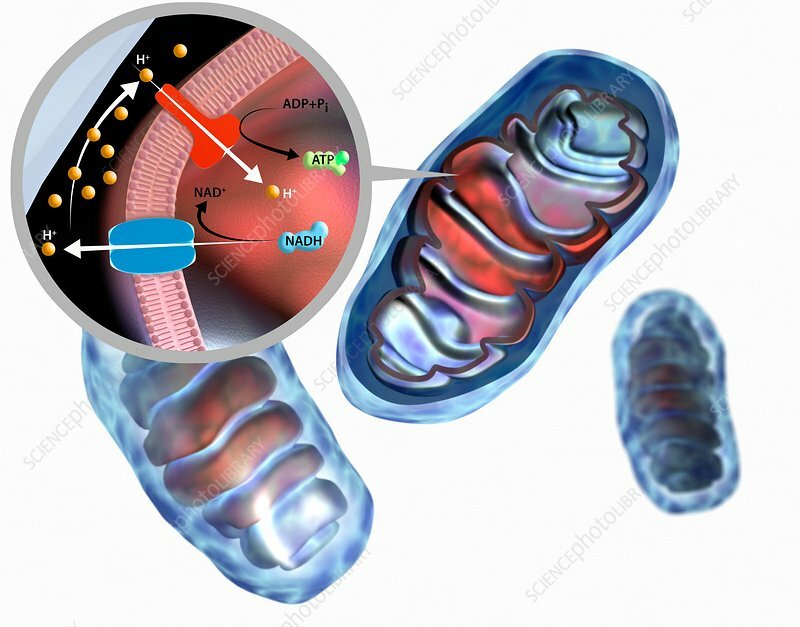 The movement of protons through ATP synthase is coupled with the synthesis of ATP (adenosine triphosphate, green) from ADP (adenosine diphosphate) and inorganic phosphate.